The second "A Celtic Autumn Evening: Samhain Celebration" was held again at the Variety Playhouse. Last years highly successful event featured storytellers, traditional Irish dancing and the music of the BorderCollies and Emerald Rose. This years celebration again featured Emerald Rose, but added special guest stars Andy M. Stewart & Gerry O Beirne in a superb night of Celtic music. The evening was divided with three total sets of traditional original Celtic music. Emerald Rose will not need an introduction to the regular readers of EAR CANDY. Emerald Rose is a high-energy rock-and-reel band from North Georgia. We’ve covered the band from their modest debut CD, “Emerald Rose” to their excellent follow-up, “Bending Tradition”. I’ve had the unique pleasure of witnessing the band’s transformation from modest beginnings to seasoned performers who have reached the pinnacle of their own niche of Celtic bands. Emerald Rose started the evening with a Celtic set. Sticking to their more traditional songs, they began with “Drowsy Maggie” and “Wild Mountain Thyme”. “Green Hills Jigs” followed, with the amazingly fast “Gallagher Lass” middle sung by Larry Morris. It is amazing to me that someone can annunciate the words to this song so fast, without the aid of chemical enhancement – “live, without a net…it’s Mad Man Morris!”! Next was “Fire in the Head”, one of the highlights from their “Bending Tradition” album. Emerald Rose slowed things down a bit for the next two songs, “Irish Heartbeat” and “Hills of America”. The vocal harmonies on “Hills” really show how much the band has advanced since its beginnings. Arthur Hinds introduced the next song “Red Haired Mary”, with a funny comment on the audience being "psychic". This song started what I call the “Celtic Mosh pit”, which is characterized by large groups of people dancing with reckless abandon, albeit in a polite way (for those of you that are not familiar with this, just picture the Irish party scene in “Titanic”-that will give you a clue). Another 'classic' Arthur intro followed, this time about “Captain Crunch and ghost stories”, the band then playing, “Loch Lomond” with their own unique version. The “Celtic Mosh pit” was back during the pounding rhythms of “Donald McGillavry”, which ended the first set. After a short intermission, the second portion of the evening began. International recording artists Andy M. Stewart and Gerry O' Beirne then played an hour-long set of their legendary music. The third part of the evening featured Emerald Rose returning with a set of their more "original" work. Yes, by this I mean their "pagan" set! The band featured some of their most popular songs including “Penny in the Well”, “Padstow”, “Summerland” and “Castle of Arianrhod”. The “Celtic Mosh pit” again developed during “Pagan Girl”. What followed was Emerald Rose’s strangest song, “Vampire Girl from Planet Orn” featuring Larry Madman Morris. I would describe it as ‘techno-rave-Celtic’, and it is a humorous song that must be heard to believe. Larry Morris has really "come out of his shell" in Emerald Rose, another benefit of the band not having a single frontman. I'm just curious to when Clyde will have a lead vocal?! At the current time Clyde seems content to provide the band with just a steady music foundation. The band continued with “Merry Mayfolk” and “Lord of the Dance”. On the last four songs of the evening, Emerald Rose had the audience in the palms of their hands. “Never Underestimate” (the song formerly known as “Southern Baptist Nightmare”) is a crowd favorite and the audience response was overwhelming. The hair on my neck arose when the singing began on “Freya, Shakti”. The band again played “Donald McGillavry”, (which I didn't mind hearing twice since it is one of my favorites) featuring the vocals of Brian Sullivan. Emerald Rose ended the night with “The Pict Song”. The most important news of the evening was that the band was recording the evening’s performance for their upcoming full-length "Live" CD, to be released in early spring! The band is also releasing a live EP in November, as a sort of teaser for the full-length CD. All I can say is…FINALLY! I’ve suggested a live album for years (in my very first ER review in fact). The band’s electric performance can only truly be experienced live, making the live CD format a natural choice. 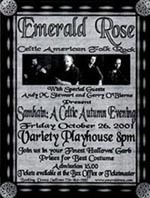 The live stage is where Emerald Rose excels as THE premier Celtic rock-and-reel band.